Now this is the commandment—the statutes and the ordinances—that the Lord your God charged me to teach you to observe in the land that you are about to cross into and occupy, so that you and your children and your children’s children may fear the Lord your God all the days of your life, and keep all his decrees and his commandments that I am commanding you, so that your days may be long. Hear therefore, O Israel, and observe them diligently, so that it may go well with you, and so that you may multiply greatly in a land flowing with milk and honey, as the Lord, the God of your ancestors, has promised you. It is part of human nature to want to know where we are going? We do not like to be picked up by the scruff of our neck and dragged away without consent. Are we walking, driving, flying…? How long will we stay? and When will we come back here? As we begin to gather that information, we will quickly start to question Who should lead this adventure? Generally, we do not choose a travel leader based upon good looks or public speaking ability. We choose them based on whoever has actually been to this place before. If no one has been to this place we are going, we generally defer to the person who has traveled the closest or traveled the most in general. We don’t need a fancy show… we need someone with experience. I think it was no accident that God led Moses to become a shepherd in the wilderness of Sinai for years before He sent Moses to bring the people through that wilderness, to the Promised Land. If you get the right leader, they can also answer the last question as well: What should we expect? This is where we get to the core of our needs. We feel control over our lives when our expectations are met. We feel out of control when they are not. We want a list as long as our need to feel in control of the situation. (You may notice that Moses only seemed to struggle with unruly Hebrews when their expectations were not met on the way to the Promised Land) However, there are other question that may be even more important to answer. Will it make a difference in us? What can we expect when we finally got to where we are going? What are we going to do there? There are four different types of people who travel, and we will have different expectations depending upon what type of person we are. First, there are Tourists. Tourists are only around for a short time and plan to come and be educated and receive the experience of being in a new place. They plan to be changed by the experience, but not to change the place they visit. They typically need to bring or pay for all of their needs while traveling. Next are Colonizers. These are people who intend to permanently relocate and reshape their new home into the form (or as close as they can come) of their former home. The Hebrew people were not Colonizers for Egypt because they did not make the Promised Land look like Egypt. However, they were colonizers in the sense that they actively removed the Canaanite influence in the area and instilled the new form of community that God instructed them. The next group are Settlers. Settlers are related to Colonizers, and semantically may as well be identical, but they usually follow Pioneers and find new ways to live in a new place. Oftentimes, settlers do not remove the former inhabitants, but simply move in next to them and forge a new community with them. The Hebrew people ultimately became settlers because they did not completely eliminate the Canaanite influence (although they were commanded to do so). The final group are Refugees. Refugees move into a new place, often not entirely by choice, and are forced to adapt to the community around them. They have little control over their environment, and often have to change themselves greatly to survive. If you can imagine going to prison, that would probably be a similar feeling to becoming a refugee. I think of the above choices, we begin as refugees in the Kingdom of God. It is not a democracy. We do not get to vote on the Ten Commandments. We either accept Christ’s Lordship over us, or we are expelled from the Kingdom. However, it is not God’s will that we remain refugees in the Kingdom of God. He wants us to adopt all the Kingdom values and truly become a part. As we change ourselves, with God’s grace and help, we become settlers and finally full citizens of God’s Kingdom. It is not an easy process though. Paul wrote to the churches that they were being made into new creations, which would mean new expectations. There would be confusion and disappointment before reaching their destination. We may not recognize ourselves once we get there. Which type of traveler do you feel like in God’s Kingdom? As you continue on your journey, what questions do you have? Tags Getting Directions, Jesus leads the way, Lord of my life, People Moving, what do I need to pack?, when are we going to get there?, which way do we go? 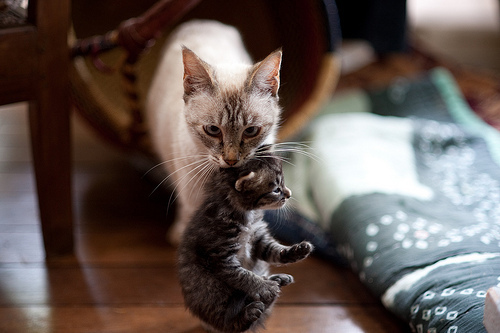 I love the picture of the cat with the kitten by the scruff of the neck. Sometimes God needs to haul me along by the scruff of the neck like that since I don’t always follow where He leads.